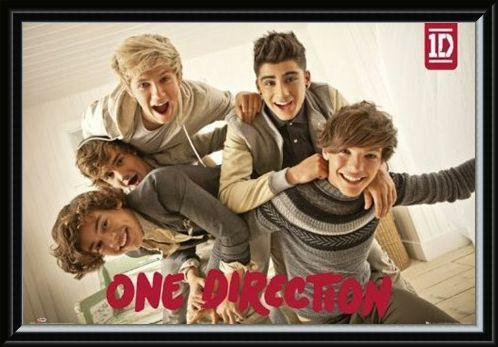 Music Maxi Poster: It’s time for a bit of rough and tumble with the One Direction boys as you hang this gorgeous maxi poster on your wall. Join Harry, Niall, Liam, Zayne and Louis as they have a playful pile on in this excellent group shot. These young lads have shot to fame after their appearance on X-Factor in 2010 and they appear unstoppable after having gained a strong following of girls and grown women alike as they charm their way into the charts. With hits including 'What Makes You Beautiful' and 'One Thing', these cheeky charmers are sure to make an eye catching addition to your bedroom wall. High quality, framed Pile On!, One Direction poster with a bespoke frame by our custom framing service.